Bibby Financial Services discusses its corporate events strategy, in line with management changes. When it comes to corporate events, Bibby Financial Services has a unique vision. Ensuring that every employee feels valued, the company recognises that inspiring passion is integral to success. "Our global CEO, David Postings, took up his role in September last year (2015). He's been revolutionary in what he wants to do for the company and has been working closely with the executive team to produce a clear and ambitious strategy for the business," says head of internal communications, Sandra Shurie. As a result, a large part of Bibby's 2016 events approach has been about sharing this strategy with UK employees. The business strategy was launched in November and the internal comms team is aiming to unite and enthuse staff to deliver these plans. "We wanted to make sure everyone knew exactly what it was we wanted to deliver for our clients and how we were going to do it, says Shurie. "We needed to get everyone in the business fired up and passionate. David is determined that everyone in the business is included, because all members of staff, no matter what level, play an important role." Overall, the financial firm runs three big events a year and five smaller ones. "The bigger ones are what we call 'inform' events, which focus on sharing information and building a clear and consistent understanding across the business," explains Shurie. "The smaller ones are 'involve' events, where we ask participants for their input to help shape our plans. These often take the form of leadership events. We ran one in May in Frankfurt for 40 of the top global leaders. People came to this event from a number of different countries to discuss our strategy in depth." 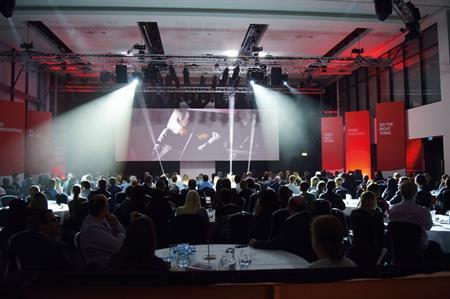 One of the biggest events of the year for Bibby is the three-day internal conference, which took place in January this year at Emirates Old Trafford in Manchester. "We've been working with DRP for four years now and they delivered our three-day conference event," says Shurie. All 750 UK employees attended, which gave staff the chance to celebrate their business wins and share future plans. During the event there was an opportunity for employees to present their own ideas and insights into cost-saving and revenue-generation. "To add tension there were live fictional news bulletins, which would have been detrimental to the business, prompting delegates to react quickly and perceptively," says Shurie. "In a Dragons' Den-style format the delegates pitched their solutions to the board of directors face-to-face - the challenge allowed everyone to converse as one big team." Describing the company's relationship with DRP, Shurie says it's more of a partnership than a client-agency relationship. "They completely understand our business strategy and goals. They go way beyond conference delivery, providing us with support and advice and guide us in the right direction. "We will go to them with a brief that is perhaps 50-60% complete. We now know we can rely on them to create the rest and it will be exactly what we're looking for. DRP is incredibly innovative and the team's creative input is really valuable, helping to increase employee engagement with key messages. They understand the core objectives and the best ways to convey those messages." In addition to the engagement and employee satisfaction witnessed at company events, Shurie says the ideas that arise from them are key to financial success. "At the conference earlier this year, during our Dragons' Den game an idea came out of that which made a significant contribution. It's not just about getting people together, it's about generating ideas that can enhance our customer service and bring the business to life. Our UK Executive Committee regularly reviews the top ten ideas, to see what progress we have made on implementation and what benefits these ideas have delivered. Events have a real ongoing impact on the business."